Moringa is new super food now a days and its seeds are edible too. Of course they are nutritious and lot of health nuts like me are eating them. I found them at local Indian store but they are available on Amazon too. Package says eat 2 a day. Do your research and see if they appeal to you. It will be an acquired taste. 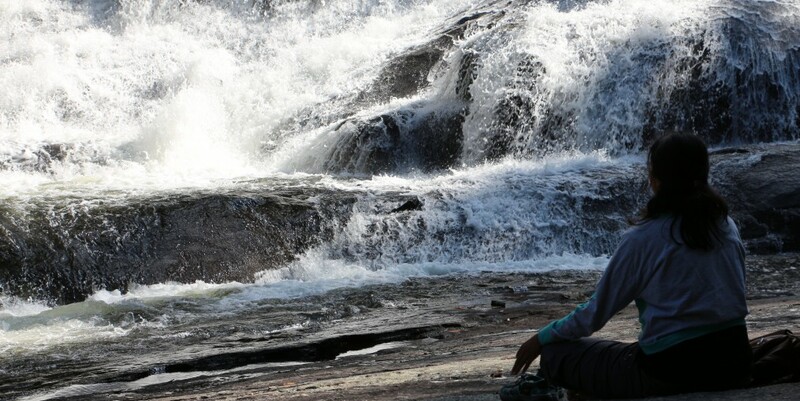 Where ever we go, we learn something new. Don’t we ? Went to Vietnamese new year festival and saw this what I call lotus mango. Very innovative. We Indians also love mangoes but had never seen cut in lotus flower shape. Mango is little underripe and peeled. It was put in a paper bowl and long stick was inserted at the bottom. Now lady chef cut the mango like a lotus flower. Sprinkle salt, lemon juice and red pepper powder. Yum ! Try it out . It will be a wonderful idea for the party. Or for kids to snack on. Rajgira or also called Amranth is very nutritious and I feel we should include in our diet more often. Lot of people are ending up with wheat allergy now a days. Why wait until then ? If your diet is so heavy on wheat , rice then it’s a good idea to start trying other things . You don’t need to fast to eat rajgira goodies. 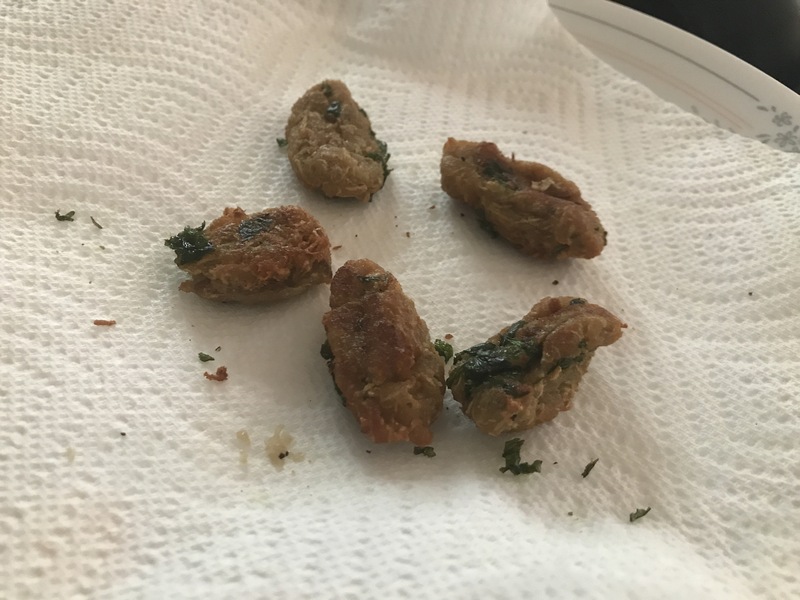 I had hardly anything today and was really hungry so I decided to make this few vadas to eat with samo khichadi. It’s very easy to make. Grate bottle gourd and remove water and keep it aside. Add rajgira flour , cumin seeds, cilantro and sindhov salt. Knead and if u need water , add that bottle gourd water you kept aside . Use remaining water to cook samo rice. Fry in peanut or coconut oil. They were tasty and made my dinner bearable. Eat in moderation. I just made few so no question of eating too many. 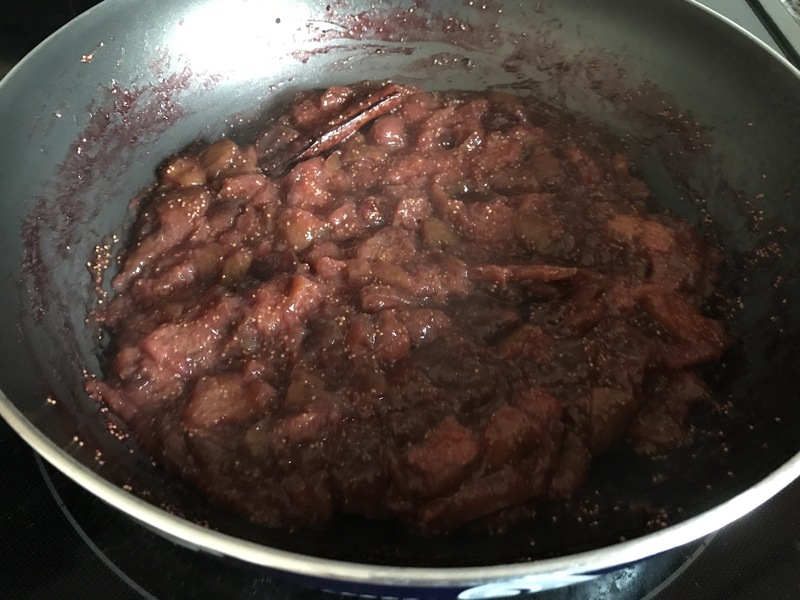 If you have a fig tree and don’t know what to do with them and you don’t want to make sugary jams then you will love this idea. My fig tree is in full bloom and I was running out of ideas. I don’t like to make things with so much sugar so I made jam once and that was all. One fine day which is today, I realized figs are naturally so sweet and once all water is gone, they are more sweet and then why the hell am I adding more sugar? Duh…and no, I don’t want to preserve jam for years. I dehydrated figs to eat in winter. Ok so visited fig tree and it gave me so many nice ripe figs. I also saw some animal poop and wonder who is visiting and eating figs. May be deer. I don’t mind them eating figs. There’s plenty for everyone and no reason to be greedy. So this is what I did and result I liked. Chop figs roughly after washing. Put it in a pot. Throw few cloves, a piece of cinnamon stick and 1 torn red chili. Teaspoon of fresh lime juice. Stir now and then . Cook until Most of the water is gone on medium heat. Taste it. Mine is little sweet, sour and hint of spice. You can add a teaspoon of chia seeds after it cools down and you want it to be thicker. You can eat this fig jam or whatever you want to call it with thepla, bread, cracker , vanilla icecream, or throw some on yogurt . How long will it stay good? I don’t know. I will eat it up and will share with friends. Do you know what makes you happy? If you are always saying I don’t like this, this makes me mad etc etc then think of what you want , what you like , what makes you happy etc etc . That’s what I call positive thinking. 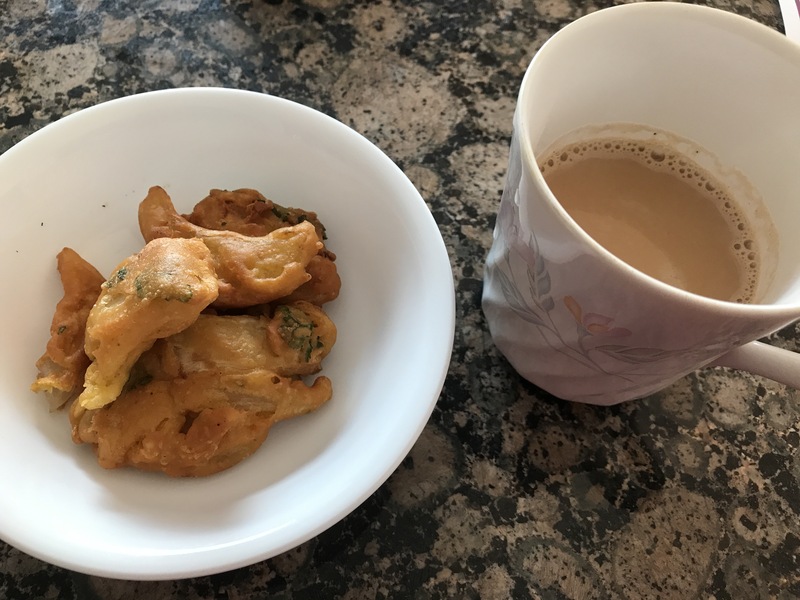 Today tea and hot onion pakoda made me happy. If you are non-Indian and love onion rings , do try this Indian version . It’s yummy. Here’s my recipe. Slice onions thinly. Add chickpea flour. Add red chilli powder, pinch of baking soda, salt. You can add little bit caraway (Ajmo) seeds, chopped cilantro. Mix well and add water little by little . You want all onion rings coated with batter. Heat oil and deep fry them at medium heat. Alternatively you can make batter separate and cut thin round onion rings. Dip each one in batter just before you fry it in oil. Serve with ketchup and Indian tea. Or just enjoy your hard work.